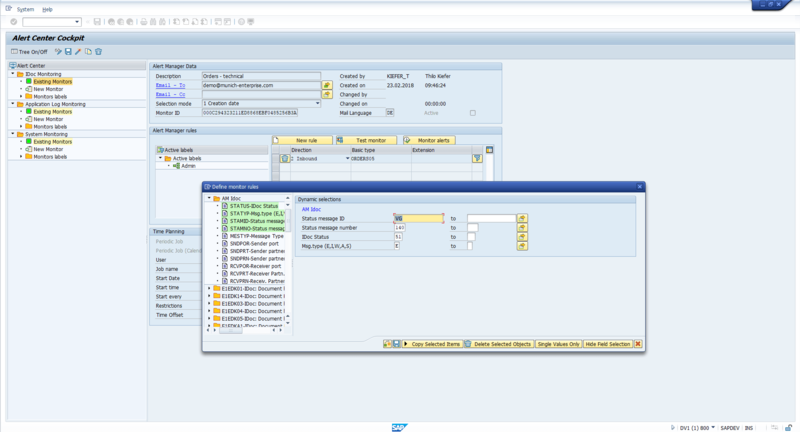 HotM is an SAP add-on for your ERP system. It supports the user in the monitoring, processing and administration of SAP processes in the areas of IDoc, application log and runtime environment. Background: In practice, many companies spend valuable time identifying and correcting bad business processes and system states. With the SAP add-on HotM, you always know whether SAP processes and the SAP system are running error-free. The HotM Cockpit can be used to easily define process monitoring monitors. These monitors contain a content and technical set of rules for periodic monitoring. Defined system states are recognized immediately. Subsequently, the responsible users are informed automatically by means of a so-called alert by email. In order to speed up the error correction, a jump out of the email takes place into the respective application. The rules for the detection and distribution of messages are defined according to individual requirements. With timely error detection, HotM helps you reduce delays in your business processes. Faulty system states are detected promptly and can be corrected immediately. Define alerts with the HotM Cockpit. These periodically check the system status. Disruptions are detected immediately and without any human effort. Due to the special user interface, the filter criteria for the respective processes can be easily defined. The IT department and subject area are relieved. With the HotM AddOn accelerate you improve the monitoring and correction of your processes. With the help of distribution lists and the simple operation, activities are transferred from IT to the responsible department. What is included in the solution for the HotM? With HotM you get a “ready-to-run” add-on. It is easy and quick to install. You will be responsible for the configuration yourself. No additional software and service components are required. The so-called alerts you add after a brief look in the application documentation itself. You have a solution right away to securely monitor and correct your processes. You want to know more about the functions of HotM? Just make an appointment for a demo. We are happy to show you this AddOn. With the help of this add-on, many companies experience a significant simplification in monitoring their business processes. Simply arrange an appointment for a live demo. Would you like further information about our products and solutions? Please call us. We look forward to you.